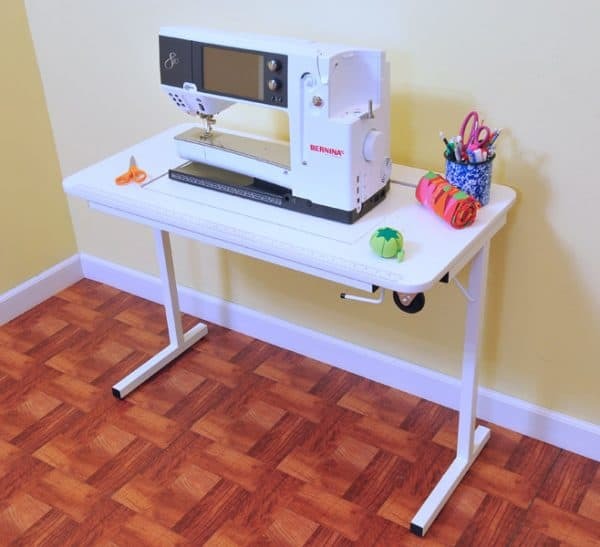 If you own a larger sewing machine, you might want to consider the Gidget II Sewing Table from Arrow which retails around $200. It is almost identical to the Gidget I, but has a bigger opening to accommodate a large sewing machine. The table also includes wheels to allow for easier movement. One thing to note about this table vs. the Gidget I: The Gidget I is made with particle board while the Gidget II is constructed from MDF (medium density fiberboard). With this table it is strongly suggested that you order the custom acrylic insert to fit your particular sewing machine due to the size of the opening. Adjustable platform: A platform specially designed for your sewing machine can move into two positions. It can sit level with the tables surface, creating a freearm position for your machine. Or, you can lower the platform into the flatbed position, which allows your sewing bed to be level with the tabletop. The platform easily adjusts to the exact height you desire, regardless of the height of your machines base. Folding Legs: Made of super strong steel, these legs are made for lasting and reliable support. To set up the table, simply open each one out and stand the table upright. Then, if you need to put the table away, just fold each one down and store the now compact table in a closet or out of the way. Flexibility: This little table does double duty. Use your sewing machine in flatbed position, then move the platform up and you’ve got a level surface to use as a desk or craft table. Portable: Fold the table legs up to reveal wheels that help you easily transport your table to classes, retreats, or on road trips. Looks: With clean, simple lines and a crisp white finish, the Gidget II easily complements a variety of decors.